Welcome to the 317th Tablescape Thursday! Ever since I met Marie a couple of years ago, Halloween has taken a huge leap forward in the FUN department. Marie lives life with tremendous joy and I have to tell you, it’s contagious! Recently I took you on a tour of the outside of her home all decorated for Halloween. We’re going inside this week for Tablescape Thursday and I can’t wait to share the tables she’s created in her breakfast room. 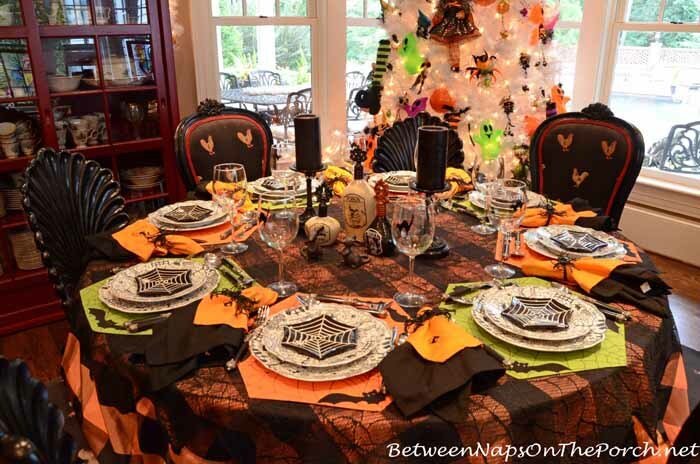 There’s a table that’s perfect for the adults and older children and a special one that’s just perfect for the wee ghosts and goblins visiting this Halloween. Marie keeps a white tree up year around here in her breakfast area. She decorates it for all the seasons and holidays. The feet sticking out the top totally made me laugh! 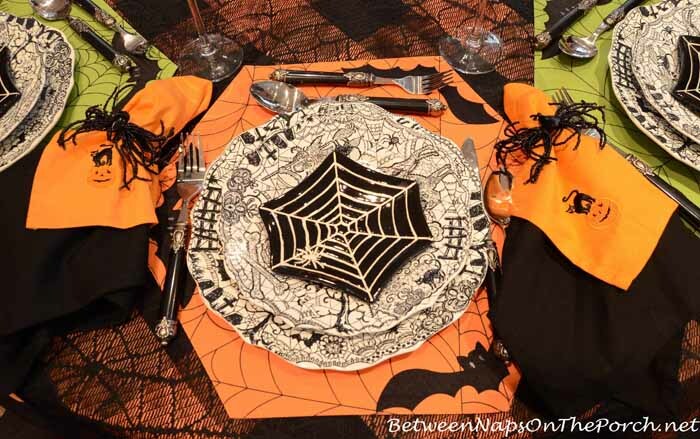 Love the black and orange check tablecloth, especially with the spider web overlay. Marie found the tablecloth online at Grandinroad last year. 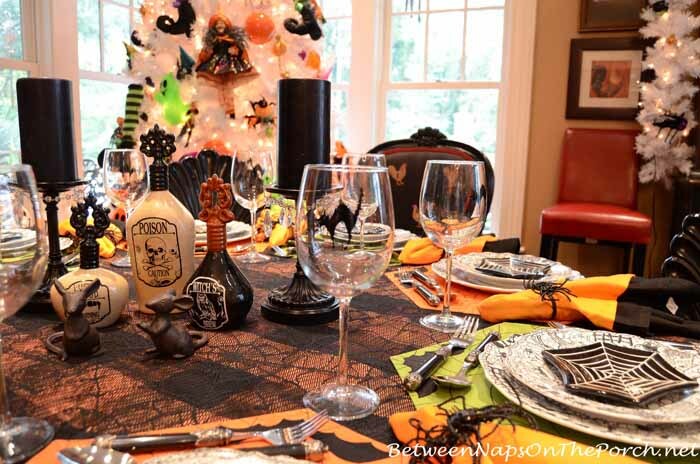 If I’m remembering correctly, Marie found her Halloween dishes in HomeGoods a few years back. The beaded napkin rings were a find on eBay. I bought some there recently so they are still some available. Just search for “Black Spider Napkin Rings for Halloween” and they should pop up. Flatware is available at Horchow online. I had a little hissy fit (pun intended) when I saw these scaredy cat wine glasses and had to have a set! Marie found them on Amazon but I also found them at Overstock dot com. Aren’t they a riot?! If you look for them on Amazon or at Overstock, just search for “Black Cat Wine Glasses” or “Halloween Cat Wine Glasses” and that should pull them up. And be careful where you sit! Some of the chairs have been known to walk away all by themselves…I’m just saying! I know Marie’s six grandchildren must LOVE coming to their grandparents home throughout the year! It’s always changing and always fun! 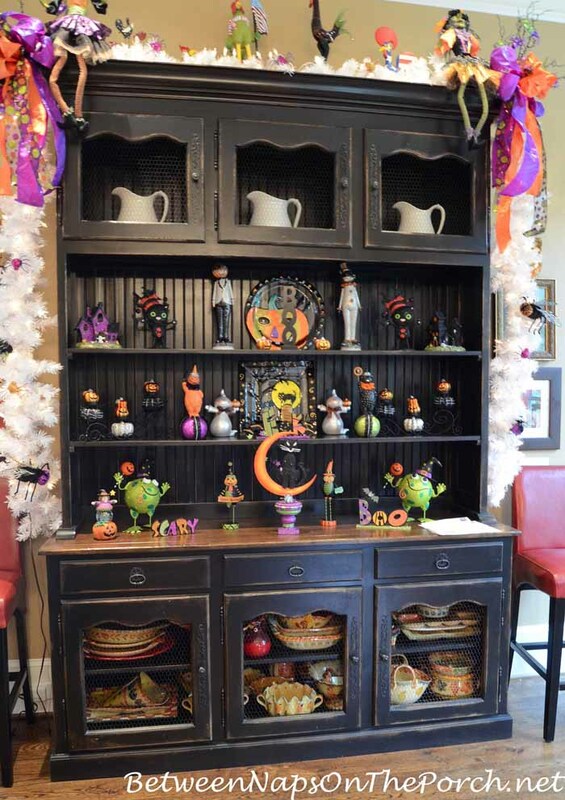 The hutch in the breakfast area was decked out for Halloween, too! I always love to see how Marie has the table for the littlest ones set. 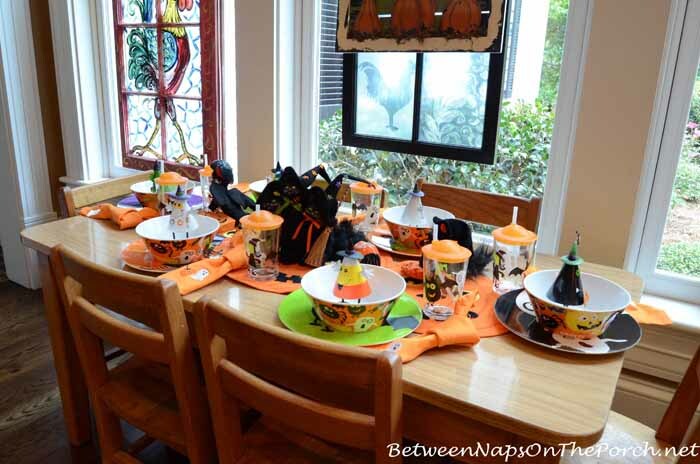 Thanks so much to Marie for sharing her fun Halloween tables this year! I can’t wait to see what she has in store for us for Christmas! The stocking chair legs always crack me up. This entire setting is adorable. Going to Grandma Marie’s must be an adventure each time. Everything is too cute. I still covet those rooster chairs!! I think we all need a friend like Marie! 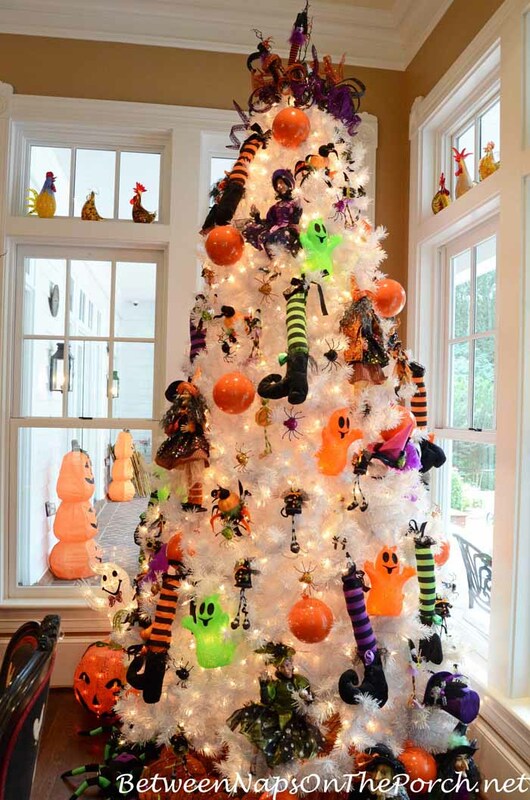 Her joyful and fun personality shines through in her seasonal decorating. And she does it for others to enjoy! Instead of doing a tablescape this week, I put together a seasonal box for the table. Thanks for hosting Susan! She must be a lot of fun to be with- I can see her enthusiasm for life through these posts that you’ve shared of their home. I love the main table- it’s too cute! That big orange checkered tablecloth made a perfect start and I love the stemware! The tree is adorable- those crazy legs are a stitch! I always enjoy seeing her creativity- I’m glad she shares this with you so we can enjoy it too! Love Marie’s sense of fun and whimsy for the seasons Susan! What a treat it must be to see her home and tables in person! These are wonderful; they actually take my breath away! I can’t say enough about everything…the dishes, the tablecloth, the wine glasses, the napkin rings…it’s all perfect. I love her attention to detail, like the legs of the chairs. Love it all! Wow, Marie’s Halloween decor is so impressive! I love the chair legs! So clever! Thank you for sourcing so many of Marie’s items. I missed the boat on the Wicken Lace black and plates cheap at Home Goods but found them recently at Replacements – more reasonable than eBay or Amazon (in case anyone else has to have them!). 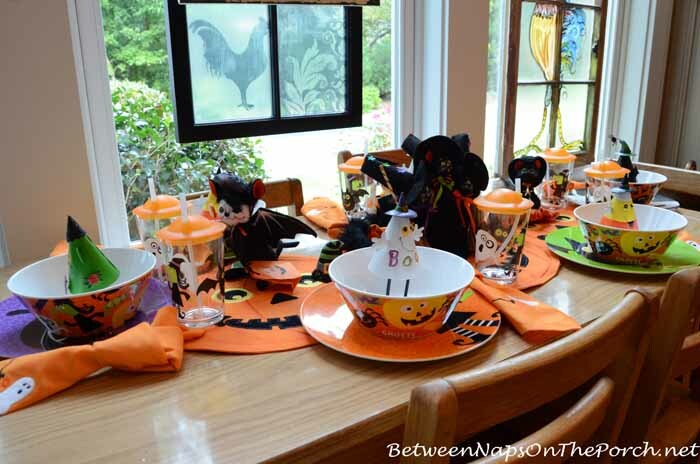 Yesterday I picked up the oval Halloween plates at William Sonoma as well as napkins and bat place cards – all half off. Not many left if anyone wants them. I love it when you take us to Marie’s Susan! She never misses a square inch when she decorates! Total Halloween fun! Thanks so much for the tabletop fun today! It’s always a festive celebration at Marie’s! I love those witches legs all over the place, lol. So cute. I also like the happy ghosts on the tree. 🙂 The green ones put me in mind of the game with the same name. I’m sure you’re right, Susan. Little kids (and big ones too) must all love going to that house. I still want to go Trick or Treating there!! What a fun Halloween display! My first thought was, “What a lot of work! Is it worth it?” Then you mentioned grandchildren visiting, so the answer is yes! Thank you for sharing Marie’s decorations. I also noticed some witch hats flying out on the porch – hung from the fan, maybe? It’s all so fun and inspiring! 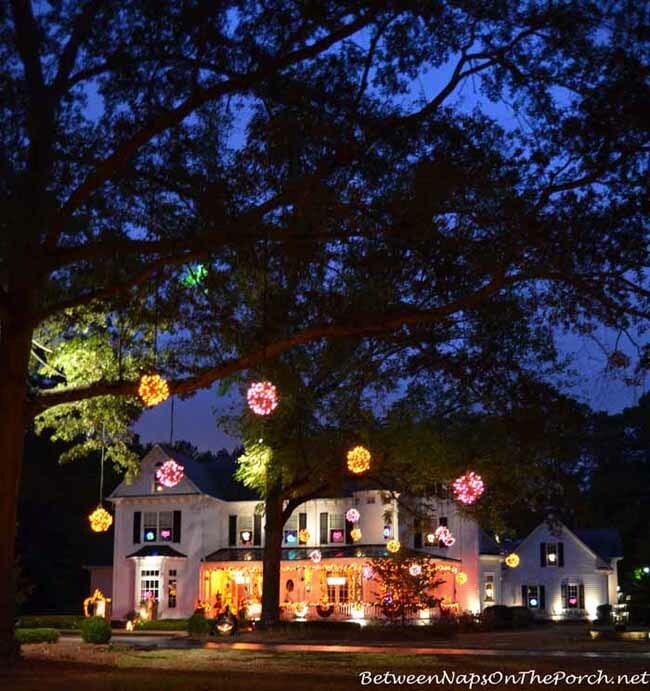 WOW, Marie sets a fun and fabulous setting for her family! Love those chair legs!!!! Happy Halloween! Oh my goodness, this is some kind of decorating. What fun rooms for her family to enjoy. As much as I love Marie’s inventive decorating, this is one Season I will not be sitting at the table…there are too many “you know whats” on there. I do love those witches chair legs though. Oh boy! Marie’s Halloween table and tree areawesome, awesome! I specially love the rooster upholstery on her chairs! 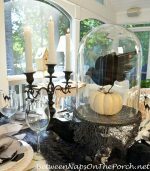 I think I did shared my past Haqlloween tables too, they were pretty spooky too, lol! I will make a one with my grands this week too. Thanks for sharing Susan and for the great party. Have a nice rest of the week. The excitement level of the kids by the time they leave must be off the charts. Marie would definitely be my favorite Grandma is I was a grandkid!!! She has such a free-spirited way of decorating, and I LOVE what did with the outside for Halloween! That’s the way to draw them in! Best house on the block!!! oh my goodness! It must be so fun for the kids (and even the adults) to stop by! Wonder what it looks like at night? 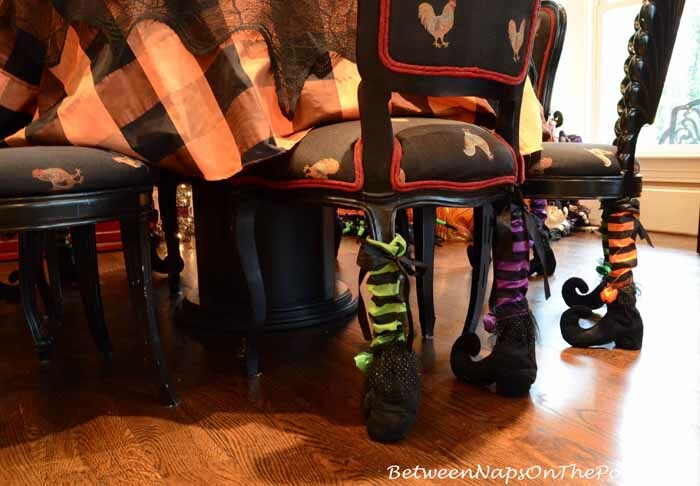 Love those little witch feet chair leg covers! So much fun!! Such fun! The kids gotta love this! Susan, your friend Marie’s home is magical – oh what lucky family she has! She must have endless energy – what attention to detail – WOW! Thank you for hosting one of my very favorite linky parties – always a joy to join in the fun. Hugs. Oh, to be a child, once again. . .
or at least a child at heart!!! 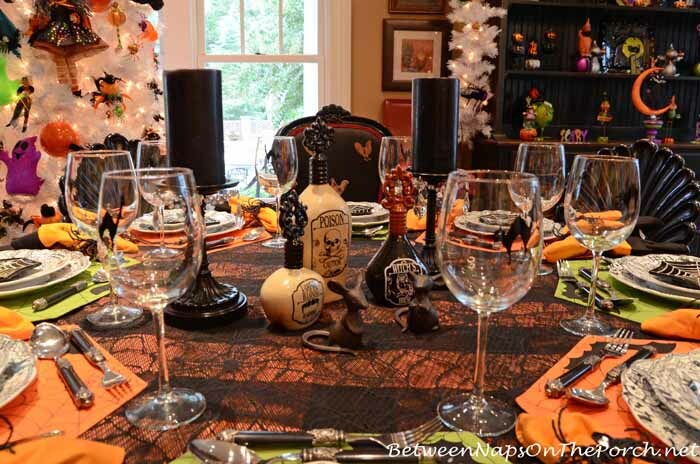 Thank you for sharing Marie’s Halloween tablescapes, dear friend! AND. . .thank you for hosting Tablescape Thursday each week! Marie is very enthusiastic about Halloween decorating, I wonder if she has someone help her. My favorite is the tablecloth, and the shoes/stockings on the chair legs. Thanks for sharing, and thanks for hosting! Hi Susan- Happy Autumn! I love Fall tablescapes, so it’s fun to check out your contributors labors of love. Just had to share I scored a BRAND new Spode Woodland large soup tureen on Ebay for $150!!! They currently sell for $400ish to as much as $850ish, depending on sales here and there. (I sold my old discontinued Gien Le Houx Christmas pottery on Ebay and to Replacements Inc to fund more dish collecting.) The tureen will be gracing Sunday dinner tomorrow as the dining room table centerpiece.